This tropical oasis with amazing views is new on the market. Downtown Punta Gorda is just minutes away. Enjoy the restaurants, shops, and entertainment of this quaint South Florida village. 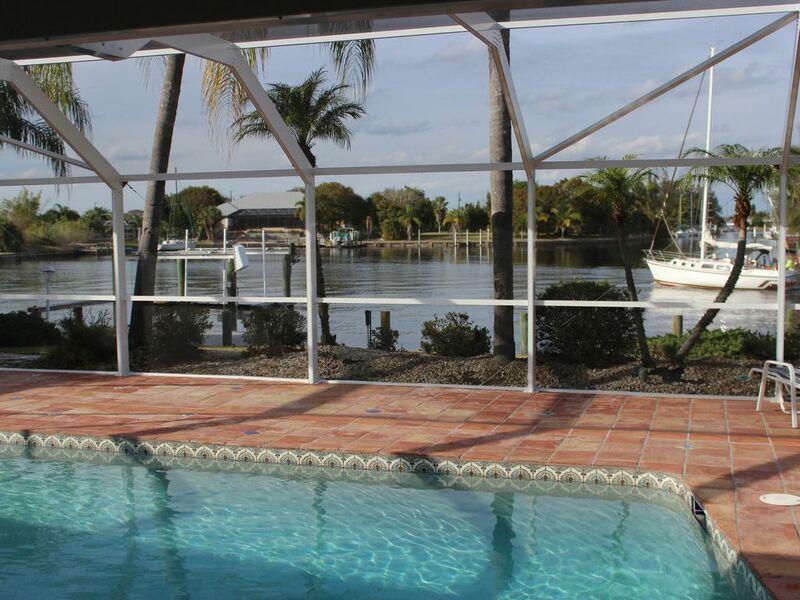 Bring your sailboat or boat, the dock is just minutes from the harbor. Bring your fishing pole and fish directly from the dock. Go for a swim or relax in comfort. The refreshing pool area is designed to open up to the tropical landscaping and canal. It features a large lanai and deck. A perfect place to take in the beautiful canal views. Ready for a meal, enjoy the gas grill and comfortable outdoor seating. There is also a pool bath house for your convenience. Take in the lush tropical landscaping, front and back. Numerous palms of all shapes and sizes highlight the landscape. A variety of other tropical fauna complement the design. Come inside and "make yourself at home". Enjoy the newly remodeled and fully equipped kitchen. The kitchen features granite counters, tile backsplash, and stainless steel appliances. It also opens to the family room with a peninsula and bar stools. Next to the kitchen is a separate dining room. The dining room features an eight seat counter height pub table. A perfect area for meals, games, and group conversations. The family room is open to the kitchen and the pool/lanai with two sets of sliding doors. It features comfortable leather furniture with recliners. Enjoy the big game or your favorite movie on the 48" HDTV. You can also enjoy your favorite music with the seven speakers. There is a separate living room with plush, comfortable furniture. All with electric recliners. A perfect place to read, relax, and enjoy conversation. The master bedroom features an elegant king sleigh bed with dual night stands and a large dresser. Is has a 40" LED HDTV with cable and HBO. The master bathroom has two separate vanities and a shower with glass doors and built-in seat. The second bedroom has a comfortable framed queen bed with dual night stands and a large dresser. The third bedroom has a cozy queen bed with dual night stands and a large dresser. The second bathroom is well decorated with a dual sink vanity and large mirror. It has a tiled shower-tub combo. toilet, shower, Counter height vanities. Shower with a built-in seat. toilet, combination tub/shower, shower, Counter height vanity with double sink. toilet, shower, Pool bathroom with shower. Bring your sailboat or boat. Just minutes from the harbor. Private dock with boat lift. Oversized two-car garage with electric opener. High-speed internet service with WIFI. Bring your laptop, tablet, or smart phone. Kitchen, bath, and beach towels are provided. Two separate living areas. Family room is open to the kitchen. It has leather furniture, 48" LED TV. Separate living room has cozy seating, all with electric recliners. Stainless steel side by side. The kitchen features grainite countertops, tile backsplash, and stainless steel appliances.It has a raised bar with four stools and is open to the family room for easy entertaining. Separate dining room with counter height pub table and eight chairs. Great for entertaining, games, or conversation. Family Room has 48" LED HDTV. Master Bedroom 42" LED HDTV. Cable with HD, DVR, and HBO. The home, lanai, and pool are on one level with no steps. The bathrooms would not be wheelchair accessible. Private screened pool heated with electric heat pump. Edgewater worked out great as our home base for watching Spring Training baseball on the gulf coast. Beautiful, clean home with a great view in a quiet neighborhood. The home came equipped with more toys than we had time to use. The pool was well maintained and the lift on the canal worked great for my buddy's small boat. Enjoyed the big margaritas at Plaza Mexico, breakfasts at Sweet's Diner, pizza at Pioneers, and German food at Sandra's. We definitely recommend the property and will rent again if we return to the area. So... Things happen when you own a pool. It is how the owner responds that either helps or hinder. We had a problem with the pool. A call to Jim and he had the pool guys there to correct the situation. They even showed up the next day to ensure the problem was corrected. When they show pictures of great homeowners... Jim is the cover. The house is extremely clean and has everything you would want. The bikes and kayaks were used daily. Would recommend and will stay again. Beautiful and location was great! We were down for the college tournament played in Port Charlotte and this home fit our needs perfectly! Absolutely fantastic home, beautiful view, quiet neighborhood, fully equipped for kitchen needs as well as beach and bath needs, and the description on line was totally accurate. We had a teensy issue during our stay (blew a fuse) and Jim answered immediately and was ready to get more help if needed. Beautiful sunsets can be seen from the dock, Port Charlotte Beach and park just minutes away with so many options for families. My family is already planning our return trip next year and hoping to add another week for a group of friends. Thank you for such a fantastic, relaxing, beautiful getaway! Hopefully we are able to return! Rare find, around the corner from bay, near Punta Gorda. Lovely home in quiet and appealing neighborhood with friendly neighbors. Very clean home with new stainless steel appliances, attractive and functional dishes, glasses, tableware and cookware. Beautiful view! Saw many dolphins in the Bay. Owner was very accommodating, enabling us to dock our boat there during our stay. Huge lania with nice 6 person table set, outdoor bathroom (great for pool users) and appealing pool maintained at 84 degrees. Highly recommend.